A few weeks ago, I wrote about the Singularity -- when machines might wrest intellectual power from us humans and take us into even more uncharted waters. (Incidentally, that post got me my first internet quote. Thanks, Rob!) But it seems, in some cases, those wily engineers have already taken power from us. This post will provide a few examples of cases where you thought you had control of something, but you usually don't. If you enjoy living in ignorant bliss, you may not want to read much further. Case #1: Crosswalk activation buttons. You know those signs, right? 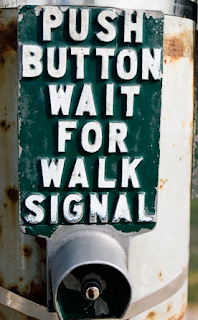 Push for Walk Signal. By the late 1980's, most of the buttons had been deactivated, their steel exteriors masking the lie within. But city officials say they do not remember ever publishing an obituary, and the white and black signs stayed up, many of them looking as new and official as ever. 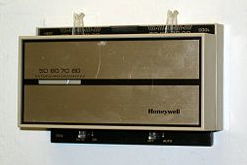 Case #2: Office thermostats. Those gray boxes with a dial or two on the wall? Their main purpose is to prevent you from calling the thermostat technician. They don't do squat. Trust me, the energy saved by your pointy-haired boss in regulating the temperature to some optimum level is worth far more than your temporary, puny discomfort. And think about it: your average HVAC company has to deal with not just you, not just your neighbor, but probably 10 or 20 different office buildings, all in the same situation. What would you do? Does he feel bad? "I did what my employer told me to do," Mr. Dawson says. The complainers in the cubicles wore him out. "You just get tired of dealing with them and you screw in a cheap thermostat. Guess what? They quit calling you." Case #3: Elevator Door Close buttons. This one shocked me. That "close door" button on elevators? It won't work unless you're a fireman or an elevator operator with special access to the system. The rest of the time, in deference to various building codes, it's deactivated, according to engineers at Otis Elevator. All those buttons are doing are giving you something to pass the time while a computer whirrs happily in the background, waiting for some specified timer to expire.